David Kyllo is pastor of Zion Lutheran Church in Deerfield. The church wanted to build affordable housing on its property but dropped the proposal after heavy opposition from village residents. A couple of years ago the congregation at Zion Lutheran Church gathered to decide what to do with five and a half acres of grassy open space surrounded by lush trees on the north side of its property. The church has called the prosperous suburb of Deerfield home since the mid-1950s and most of the area is surrounded by large single-family homes. But Pastor David Kyllo said members ruled out building more McMansions. “We were a little bit concerned about that because that’s really not giving back to the community,” Kyllo said. He says another idea bubbled to the surface: affordable housing. Zion Lutheran saw this as an opportunity to build housing for people who work in the area, but can’t afford to live there. The congregation voted to go forward with the plan and a developer was brought on board. Called Zion Woods, it would consist of 48 apartments for families of four earning $45,000 a year with rents no more than $900 a month. The church wanted to use Low-Income Housing Tax Credits, the largest federal initiative for building affordable housing. The LIHTC program, begun in 1986, gives developers the tax credits as an incentive to promote fair housing and integration. WBEZ analyzed where LIHTC credits have been used since the program&apos;s inception and found affordable housing tends to be clustered in areas with higher rates of poverty and racial segregation. That means fewer developments are being built in wealthy suburbs like Deerfield. About 25 miles north of Chicago, the village is home to corporations like Walgreens and Baxter. It’s population is 94 percent white, and the median income is $103,000. With access to good schools and jobs, Deerfield is considered an “opportunity area” for families in need of affordability and more amenities. This was one of the reasons behind Zion Lutheran’s proposed development. But it soon became clear that its benevolent mission didn’t inspire everyone. In May, the church presented its proposal at a public meeting of the Deerfield Plan Commission (the video can be found here) and opposition was fierce. Even before the meeting opponents sent dozens of letters to the village, criticizing the development and a necessary zoning change. Many neighbors cited concerns about density, traffic and declining property values. Others worried about school overcrowding (district officials have said those fears are unfounded). One resident speculated that children in the housing development will be "prone to violence and theft." This isn’t the first time Deerfield has been caught up in a controversy over new housing. Back in 1959, the uproar over a proposed integrated subdivision made national headlines. Residents used racist comments to talk about the threat to their property values. Some even characterized integrated housing as an economic stab in the back. Ultimately, the homes were never built. The entire episode was chronicled in the book But Not Next Door (1962), written by Harry and David Rosen, brothers and social workers who lived in Deerfield. It was referenced more than once by supporters of the Zion Woods project during the public hearing in May. For decades after World War II, housing policy favored suburbs like Deerfield. There was federal financing for single family homes. New expressways helped facilitate white flight. The Fair Housing Act of 1968 was supposed to fix this. But nearly 50 years later, the law still has more bark than bite. Deerfield Mayor Harriet Rosenthal insists the village is addressing the issue of affordable housing in its comprehensive plan. In 2009, no LIHTC developments were in Chicago suburban opportunity areas. Today, that number is improving, but there is still resistance in many communities. Jessica Berzac is a developer who works particularly in the Northwest suburbs. She recently worked on an independent living development in Wheeling for people with various disabilities. The prosperous suburb is deemed an opportunity area. The median household income is higher than the region’s average and there’s high access to jobs, abundant commercial activity and good schools. Berzac said initially neighbors objected and repeated familiar anxieties. “&apos;These people will wander the streets and change the character of my neighborhood. When I bought my home here 30 years ago, I expected to only be surrounded by single-family homes,&apos;” Berzac recalled. Originally, the Wheeling village board said no to the development. Berzac’s company sued. A settlement was reached and recently Berzac finally closed on the property — five years after she began. Another suburban affordable housing project, Myers Place in Mt. Prospect, breezed through for Berzac’s team. It, too, is independent living with supportive services for the mentally ill and disabled. Delfina Constanza has lived at Myers Place for two years. She’s a domestic violence survivor and suffers from depression. “I was living in my car when I moved here,” she said. Constanza had been on a waitlist to find supportive housing. Then she received a piece of good news in the mail. She pays three hundred dollars a month in rent for her one bedroom apartment, and has on-site services to manage her depression. Getting suburbs in opportunity areas to embrace affordable housing can still be an uphill climb, but that&apos;s starting to change because of various federal and state policies. This past July, U.S. Department of Housing and Urban Development Secretary Julian Castro visited Chicago to announce a new rule: locales that receive HUD funding must turn in a plan outlining their affordable housing strategies. “This represents a new partnership with cities and other public entities. One that makes it easier to fulfill the goals of the 1968 Fair Housing Act,” Castro said at a former Chicago public housing site on the South Side. Just a month before, the U.S. Supreme Court ruled that even unintentional policies that segregate minorities in poor neighborhoods are in violation of the Fair Housing Act, which bans racial discrimination. The case centered on Low Income Housing Tax Credits. These were two huge wins for affordable and fair housing that advocates say will have an impact in Illinois. The Illinois Housing Development Authority allocates federal tax credits to sell to investors to generate private equity for affordable housing developments. That reduces the developer’s debt who can in turn offer lower rents. Excluding Chicago, IHDA allocates $23 million dollars in tax credits for the state. 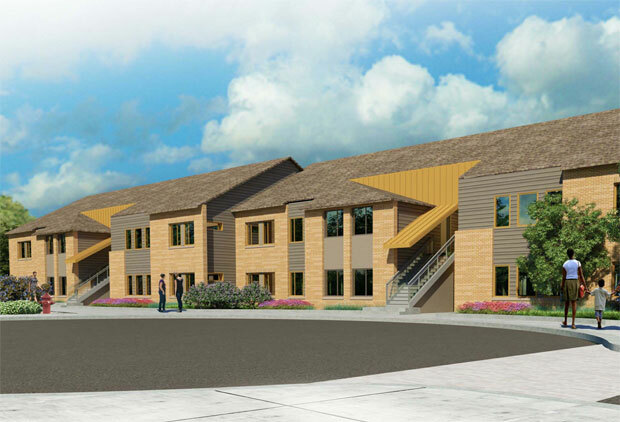 “We’ve seen an abundance for affordable housing and tax credit projects in particular within certain communities and not others,” said Mary Kenney, the recently departed executive director of IHDA. Kenney said 10 years ago the agency started looking at unemployment and poverty. Officials analyzed where tax credits were going — and where they were not. IHDA came up with a plan and won’t accept affordable housing applications in places where there’s an abundance. Developers now receive more points if their proposal is for an opportunity area. This last go-round of low income tax credit awardees included one third in opportunity areas. “When I speak publicly, one of the first things I say to people is you walk by buildings I’ve financed every single day and you don’t know it,” Kenney said. Like the four-story, 39 unit Myers Place in Mt. Prospect where Delfina Constanza lives. Kenney said other tools can nudge defiant communities. Illinois&apos;s Affordable Housing Planning and Appeal Act was enacted in 2003 to encourage local governments to incorporate affordable housing into their communities. Yet many affluent municipalities, like Deerfield, skirt the law citing home rule. The state said Deerfield is in violation but nonetheless faces no penalties. “It’s never had its first case. And it’s largely because they don’t have the teeth in terms of enforcement," Kenney said. "I’d love to see the [State Housing Appeals Board] empowered. If you asked me one easy thing we could do, we could tighten up the statute down in Springfield. We could make it applicable to home rule units." Other advocates have argued for a regional government to help balance where affordable housing goes so municipalities don’t act on their own. Gail Schechter, executive director of Open Communities, a north suburban group that promotes integration, is looking for new approaches. The group used to have &apos;housing&apos; in its name but dropped it to sound more inclusive. “If you’re an advocate for low-income people and their right to live where they choose, and you believe in mixed-income housing, hammering that as it is, is not necessarily going to convince people,” Schechter said. Back at Zion Lutheran Church in Deerfield, Pastor Kyllo said people are definitely not convinced. He sits on a bench facing the open land where members had hoped to build 48 units of much-needed affordable housing. Not long ago the congregation withdrew its proposal for Zion Woods. Kyllo admits they capitulated to the pressure. “I wish that I could say otherwise. People have a discriminatory taste in their thoughts. I don’t think they have a realistic look at what life could be like. I don’t think they’re willing to change and look at new ways of thinking. I don&apos;t think they are looking at the possibility about what a greater integration could mean for the community and the richness that could draw on,” Kyllo said. But he’s not giving up. And when his team goes back to the drawing board, he says they’ll take a lesson with them. Natalie Moore is WBEZ’s South Side Bureau reporter. Email her at nmoore@wbez.org. Follow Natalie on Twitter.